I tried something new!!! And you can also guess what I had for dinner and for breakfast today. I made a Milchreis casserole, a kind of a sweet dish you can also eat when it's cold. All you need for it is a pot of Milchreis (check the link), and three/four eggs, 250g (9 oz) Quark, a pound or more of apples, some cinnamon, 4 tbs. sugar. Next time I will definitely take more apples but it was everything I had at home and I got a cold a couple of days ago so I don't feel like going outside to get some more. In the meantime clean the apples and cut them in small pieces. Separate the eggs (yolks from the white), beat the egg whites until stiff. Put it aside. With a mixer mix the yolks with the sugar and cinnamon and add the Quark. 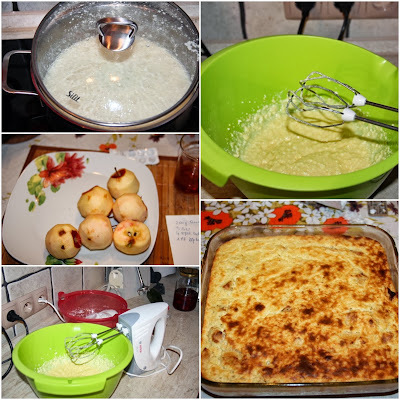 Add the cooked rice and the apples to the egg-Quark-mixture. Butter a baking pan I took a 12x12 inches/30x30 cm and put the mixture inside. Bake around 40 minutes at 200°C/390°F. Serve with compote or with a fruits mouse. It's great as a sweet main dish but also as a dessert. It's delicious when it's served with some vanilla ice. Enjoy!